As the rain comes down in sheets outside the window today, I pulled out one of my favorite collections of poems and was reminded how wonderful it is. 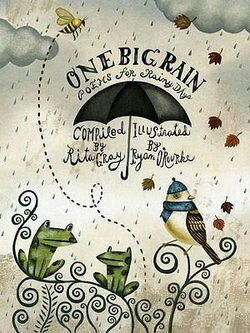 Writer Rita Gray and Illustrator Ryan O’Rourke have teamed up to create a lovely little book, One Big Rain: Poems for Rainy Days. This simple little book is the perfect thing to snuggle up with, tucked in a big blanket and sipping a cup of hot chocolate. And with various styles of poems, from haiku to free verse to rhyming meters, it’s a great introduction to the wonder of poetry itself. The poems themselves are organized by season, so you’ll find poems that capture the warmth of a summer rain, the harsh coldness of a winter rain and the refreshing and flower-filled rains of spring all in one book. (And imagine my joy at finding one of my favorite poems, Robert Frost’s To the Thawing Wind!) The illustrations are some of my favorites of all time – O-Rourke has outdone himself…So, go ahead and tuck yourself in today…start that pot to boil and cuddle up with this wonderful book.